No time for gardening? This miniature kitchen garden is planted directly into a bag of potting soil. No mess, no fuss, no bending over or weeding needed. Three kinds of lettuce, radishes, and other salad makings can be right at your fingertips! 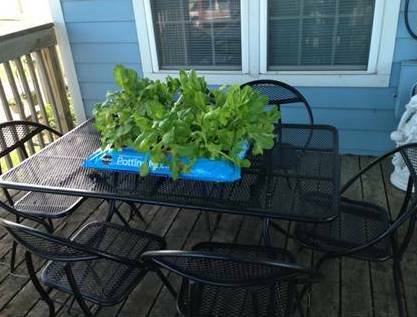 Fresh salad whenever you want and as near as your deck or patio. 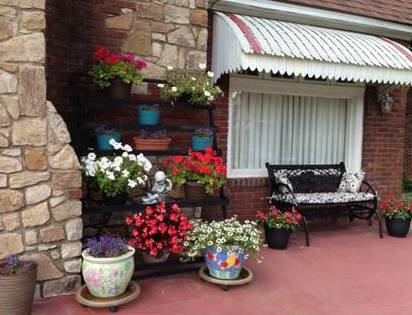 And here’s an idea for a no fuss flower garden right on your porch. A rack holding potted flowers requires no weeding or labor. Just add water, sit back with a good book, and enjoy the color and aroma of fresh flowers all summer long!